The Rice Lake Weighing Systems 920i digital weight indicator has been an extremely successful indicator. It’s been utilized in thousands of different applications with accurate and reliable results. But as we all know things change and technology improves. So Rice Lake is making a few updates to the 920i which should allow it to continue to be a great choice for your scale needs for years to come. 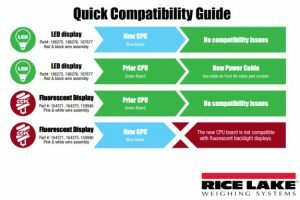 To make the 920i programmable weight indicator even more robust and further extend its life, Rice Lake Weighing Systems is now manufacturing the 920i with enhanced display and CPU boards. These changes offer several benefits and are essential to ensure availability of components needed to continue manufacturing the 920i in the future. As of February 1, 2018, Rice Lake began manufacturing the 920i with a technologically improved LED backlight display. While this change may go unnoticed, it affects the replacement part process. If a 920i was built prior to February 1, 2018, and needs a replacement display, Rice Lake recommends replacing the old fluorescent backlight display with a new LED backlight display. Please note, fluorescent backlight displays are temporarily available if an upgrade to LED is not desired. CPU boards compatible with fluorescent backlights are also temporarily available. The new CPU board is not compatible with fluorescent backlight displays, please use caution when ordering replacement parts. Call the sales / service team at Central Carolina Scale (919) 776-7737 to obtain the 920i indicators and replacement parts that you need. For replacement parts, you will want to have indicator serial numbers handy along with the date that you purchased the indicator. Over the years we have been asked quite a few times about different ways to effectively weigh things like Recreational Vehicles and Trailers that are custom built. 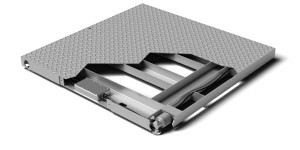 One of the choices that we often recommend is one of the wheel weighers from Intercomp such as the LP600. As you can see from the case study below, the Intercomp LP600 wheel weigher is often a very accurate and flexible choice for companies in today’s world. As the size and complexity of modern RVs continue to increase,manufacturers and customers must also take into account axle weight compliance and safe weight distribution. While an RV may be weight compliant, RV manufacturers and dealers need to ensure these vehicles are safe to drive once the end user loads personal items, water and fuel. In the RV market, checking and understanding weight distribution among the vehicle’s axles is becoming increasingly important. 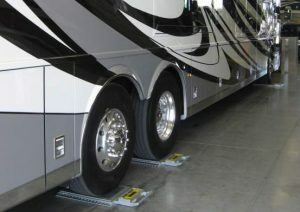 Manufacturers, dealers and owners need to have a better understanding of weight for the sake of compliance and safety. North Trail RV, a dealer for one of the most well-known RV manufacturers in the United States, decided to tackle these potential issues. The company needed an accurate way to measure GVW (Gross Vehicle Weight), and obtain wheel and axle weights, to ensure proper load distribution when fully loaded with personal equipment, fuel and water. The dealer also wanted a way to record and print the data to provide the customer during the final walk through and when customers brought their RV back to the dealer for a standard one-month checkup. With six LP600™s, North Trail RV recognized an increase in buyer satisfaction based on the additional information provided to each customer after fully loading their RV. The dealer also gained a better handle on what additions and modifications produced the most significant changes in weight distribution. In addition, the scales helped dealer technicians troubleshoot potential problems with suspension components and tires during the one-month checkup. Not only did this decrease the possibility of the customer having service issues in the near future, but it also helped customers understand how critical weight distribution is to proper drive ability and safety while using the unit. If this sounds like a solution that you could use for your business, then give us a call at (919) 776-7737 or visit our website and click the Request a Quote button. Today more and more customers want to not only measure the weight of their products, but they also want to capture that information and send it to their laptop computer for data collection and further analysis. There are several ways to do this, and various software programs to help accomplish this as well. We offer various communication types like USB and ethernet and we offer some of the software as well, such as Doran Excelerator. But today we wanted to mention the WinSPC software. Quite a few customers over the years have been interested in having their digital scales be able to connect to this real time statistical process control software. WinSPC basically allows companies to compete in today’s worldwide economy since many manufacturers must constantly discover new and innovative ways to cut costs while consistently delivering the highest quality products for their customers. Now it’s important to note up front that we don’t sell WinSPC. The product does seem to be a really nice software though. WinSPC provides a proven, effective way for manufacturers to quickly improve quality, reduce variation, monitor production or process changes, increase profitability and more. Best of all, WinSPC runs in real-time, collecting data to deliver real meaningful process information directly to operators or to quality engineers, supervisors, and management. WinSPC is a very popular real-time process control tool of choice for manufacturers that need a top of the line solution because WinSPC provides real time SPC capability than quality modules or other process control software products. A key requirement of most continuous improvement, Six Sigma, and Lean Six Sigma programs is the ability to access timely manufacturing data. WinSPC’s data collection software enable manufacturers to quickly obtain product and process data from nearly any shop floor source, including: serial devices, text files, machines, gauges, databases, and other manufacturing systems. WinSPC’s data collection features offer the fastest, easiest way for quality engineers to quickly gather manual input, connect to devices, and capture data from other manufacturing sources. The reason we’re mentioning all of this is that if you’re currently using WinSPC (or you’re thinking of purchasing it) and you need to add some digital scales to your company, give us a call at (919) 776-7737. Our outstanding selection of Doran Scales can be setup to communicate effortlessly with the WinSPC software. Doran Scales offers RS-232 serial, usb, and ethernet connectivity. Many of these scales are NTEP legal for trade and many of the scales are available in stainless steel washdown capability if needed. With Doran’s Excel Series Indicators line comes an array of “Value Added Standard Features and Options” for a wide variety of applications. In the scale industry, the RS232 Serial Port has been used for communications between scales, computers, or printers since the introduction of the personal computer. In 2002, PC manufacturers agreed to obsolete Serial Ports over time and replace them with USB communication ports. Therefore, today’s computers are not always equipped with an RS-232 port, which makes the use of USB absolutely necessary. There are several benefits to using USB communications over RS232 Serial Ports. These include ease of use, reliability, flexibility, and compatibility. Virtually every company today has an Ethernet network to distribute email, provide Internet access, share printers, and run enterprise wide software. Customers both large and small can leverage their existing Ethernet and PC hardware infrastructure and extend it to the factory floor. The merging of the administrative, control level, and device level networks makes for a less expensive and more connected data network. The result is an efficient end-to-end flow of data from the plant floor to the front office network, where it can be used to better manage operations. Adding scales to an existing Ethernet network will not adversely affect the network speeds for existing devices. The speed of 10/100Base-T Ethernet networks that provide up to 100 Mbps communication bandwidth clearly eclipses the requirements for scale communications. A typical scale data string only requires about 200 bits, a tiny fraction of the available bandwidth for Ethernet. As an example of the speed of Doran’s Ethernet option; The Excelerator Data collection software can monitor up to 20 scales with continuous print into one spreadsheet workbook in real time, while only utilizing 0.004% of the total network’s Ethernet bandwidth. Compare this to loading Google on Internet Explorer, which requires quite a bit more network bandwidth! Utilizing the existing Ethernet network without affecting existing devices makes Doran’s Ethernet communications option extremely cost effective. The point of this article is to simply let you know that if you currently use WinSPC, or are considering purchasing the software, please keep us in mind when it comes to purchasing new digital scales that can connect to WinSPC software. You can reach our sales team at (919) 776-7737 or fill out our RFQ on the website. Food safety is extremely important to all of us. In today’s ultra competitive and fast paced world, it’s imperative that we have laws in place to ensure that the food we eat is as safe as possible. We hope the article below helps you better understand information about the Food Safety Modernization Act (FSMA). Ultimately we think this information will highlight the ability of Rice Lake’s washdown products to meet your requirements of commercial processing industries. The FSMA info below not only informs producers about how to meet compliance laws, but demonstrates how Rice Lake scales can help prevent food contamination by the integrity of their construction and design. For all producers, from the farm to the table, purchasing equipment that meets Sanitary Design Principles (SDP) is considered a mandatory preventative measure by the FDA. Our product offerings that are microbiologically cleanable, hermetically sealed and compatible with hostile environments can greatly assist you in adhering to these strict guidelines. On January 4, 2011, President Obama signed the FDA Food Safety Modernization Act (FSMA) into law. The FSMA brought a much-needed focus of food safety laws into the food processing industry as well as to consumers, and the general public as a whole. The signing of the FSMA was arguably the largest reform to food safety in the previous 70 years. According to the U.S. Food & Drug Administration (FDA), the FSMA “aims to ensure the U.S. food supply is safe by shifting the focus from responding to contamination to preventing it.” The key focus being prevention versus reaction in regards to food safety, from all aspects and stages of food—from the farm to the table. The FSMA was spurred into action from an increase in foodborne illnesses in the U.S. The Centers for Disease Control and Prevention report almost 1 in 6 Americans fall ill to food borne diseases each year. Foodborne illness became an issue of public health in the early 2000s, enabling the FDA to set higher preventative standards for food safety and elicit enforcement agencies to hold companies to these standards and contain any potential problems before they become a widespread risk of foodborne illness. To do this, the FDA under the FSMA can order companies to recall when needed. The primary role of the FSMA is prevention. As noted by the FDA, “for the first time, FDA will have a legislative mandate to require comprehensive, science-based preventative controls across the food supply.” This legislative power ensures all U.S. companies that contribute to the food supply, no matter their size, are subject to the authority of the FDA and their preventative and responding agency. 5 ) Specifying what actions the facility will take to correct problems that arise. In this article, you’re going to learn the correct way to use an analytical balance. 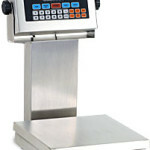 These weighing devices are much more sensitive, accurate, and precise than larger topload balances or industrial scales. These balances are used for low mass samples, where specific weights are needed. Before using the balance, you need to make sure that it’s level. To do this, check the level bubble. If the bubble is located within the black circle then the balance is level. If the bubble is outside of this circle then the balance is not level. If you find a balance that is not level, carefully adjust the foot on each corner until the bubble is located in the center. 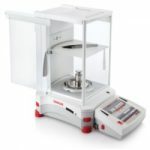 In most cases, you should not attempt to move an analytical balance because they are very sensitive. If you do, then you will want to make sure the balance is still weighing correctly. Before you start, you should make sure that the inside of the balance is clean and dry. You should also make sure that all of the doors are closed when you are recording your masses. This prevents air from flowing through the balance. These balances are so sensitive that even air pressure can effect their reading. Now you can begin. The balance should already be turned on with a reading of 0.00 grams on the display. If the display says something other than zero, push the “zero” button. This will reset the balance to 0.00. The display will also indicate the units of mass. 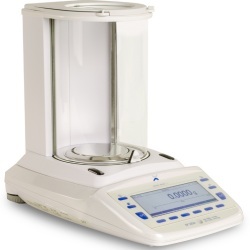 The analytical balance can report masses in several units, so you should ensure to set yours to grams in most cases. Make sure your item is clean and dry, and then gently open one of the doors. Place your item inside and gently close the door behind it. Wait for the reading to stabilize, and then record it. To remove the item, open the door, just as before, remove your item, and close the door gently. Because analytical balances are much more sensitive than top load balances, there are a few extra precautions to keep in mind. You should never put liquid inside the analytical balance unless specifically instructed to do so. If you do have to put liquid in there, make sure you use a container that seals tightly. If there are ever any spills inside the analytical balance, clean it up according to the manufacturer instructions. It’s not usually a good idea to add a substance to your object while on the analytical balance. A better choice would be to, remove your item, add your sample, and place it back into the balance. If you need to make multiple measurements of the same item make sure to use the same balance each time. There is a small error associated with each of the balances so using the same one keeps it consistent so that it cancels out in the difference. For the most accurate results, you shouldn’t handle the sample with your bare hands. You should use gloves or tongs to handle your sample because the oils on your finger can transfer to the glass, which will be picked up by the analytical balance. You should never lean on the bench when using the analytical balance because this small difference can alter the weight slightly. Make sure that the item that you are placing into the analytical balance is at room temperature. If it’s above room temperature, it can create air currents within the balance and it can also effect the buoyancy of your item by heating the air around it. This creates an error in your results. Using expensive and sensitive equipment can sometimes leave you unsure of how to proceed but if you follow the instructions that we’ve presented, then you have nothing to worry about when using an analytical balance. If you need assistance calibrating your scientific scale or perhaps you’re looking to purchase additional laboratory balances, please contact the experienced sales and service staff at Central Carolina Scale, call (919) 776-7737. In a concrete batching plant typically all of the ingredients that go into the concrete are measured by weight with certified digital scales. As you can imagine, those scales that are batching and mixing of concrete, need to be calibrated on a regular basis in order to maintain accurate weighing. At Central Carolina Scale, we have checked and tested ready mixed concrete hopper scales for many years. Over all these years, concrete batching plant calibration procedures have evolved and we have also made changes to adapt to new guidelines and requirements. 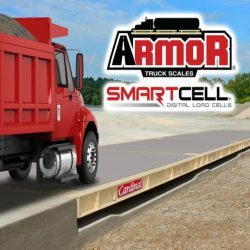 Whether it’s asphalt plant calibration or concrete batching, we have many years of experience repairing and calibrating these digital scale systems throughout central and eastern North Carolina. While we don’t sell Command Alkon or Mettler Toledo indicators, we have worked on many systems that include those units. Popular instruments that we offer for sale include the Cardinal 205. For concrete producers looking to achieve National Ready Mixed Concrete Association (NRMCA) Plant Certification, they need to adhere to the Guidance to Concrete Producers maintaining plant certification. This includes a list of Primary Requirements, Plant Inspector Guide and most importantly to us, the Scale Accuracy Verification guide. There are some differences in what the scale companies are accustomed to doing in accordance with NIST Handbook 44 and what is required by the NRMCA plant certification and ASTM C94. Some of these differences are described in the Plant Inspector’s Guide. Minimum quantity of test weights should be at 10% of scale capacity. Aggregate scale capacities will generally govern the minimum amount of test weights required – about 4000 lbs is typically needed. (There may be situations where the plant configuration does not permit the minimum test weights to be used and that has to be verified by the plant inspector). Test weights should be certified to be accurate to 0.01% of their indicated load within the last two years. This is typically not a problem with commercial scale companies. Scale checks should be done through range of use of the scales. Scale companies may only verify it through 50% of the scale capacity. Up through 50% of the scale capacity, scale checks should be done using a build-up test load using a combination of product and test weights in a process called a substitution loading. Scale increments should not be skipped. In substitution loading, product in the scale should only be to the load previously verified – as close as possible. Over 50% of the scale capacity, strain test loading is permitted. An unknown quantity of product is charged and the incremental weight indication with the test weights is verified. At least two points should be tested in this portion of the scale – through typical range of use. ● If it’s not accurate the scale has to be adjusted. Maintenance tolerances in accordance with Handbook 44 are stated on the basis of scale divisions (min grad) but are generally more restrictive than those in C94 that state tolerances based on applied load or scale capacity. A copy of the scale verification data sheets should be obtained to indicate details of the test loads used, test load increments, load indications and load error. A certificate just indicating a scale is OK is not acceptable. Definitions of load testing, concrete batching plant calibration format, discussions and numerical examples of the scale accuracy verification are available in the NRMCA Plant Inspector Guide. Accuracy checks of measuring devices (scales, water meters, admixture dispensers and moisture probes) should be performed at least once every 6 months. State DOTs may have a requirement for these to be performed more frequently. The requirement with the greater frequency governs. Documentation of these verifications should be maintained and made available to the inspector during the plant inspection. Also, scale accuracy should be verified anytime the plant is moved (portable plants), maintenance activities on the plant impact the weighing systems, or when there is a concern on scale accuracy determined from the batch man operating the batching process or the quality of concrete. For customers throughout the central part of North Carolina, adhering to the NRMCA requirements can be accomplished with the help of the experienced service technicians of Central Carolina Scale located in Sanford, NC. We have the trucks to handle these requirements and we have the large certified test weights (and small weights too) needed to accurately test your digital scales. And we also stock a huge amount of replacement load cells, digital weight indicators, load cell cable, and other scale accessories to keep your batching plant up and going year round. Contact our service department today (919) 776-7737 or fill out the RFQ button on our website for additional information.